My interest in art and culture started when one day, after being dragged by my parents to museums from a young age, I finally started to appreciate what I’d been seeing. I’ve been to countless museums in my lifetime: hours upon hours spent at the Met in New York, countless visits to the Centre Pompidou in Paris, etc. Museums are the perfect way to escape the present, taking you to places in your mind full of memories; a work of art reminds us of some sort of past passion, rage, angst — any (and every) emotion. Going to a museum sparks so much inspiration and motivation in me that I always leave with a sense of fulfillment. It is with this avid interest in art I decided to pursue a minor in art and architectural history with a focus on modern art. Over a year ago while studying in Scotland, I had a three week break for “revisions” (Europeans love to give lots of long breaks, its wonderful). The majority of this time was spent touring Italy with my family, however the one place I needed to go was Venice — it’s sinking, after all, and I wanted to see it before it becomes nonexistent. And most importantly, it is home to the Peggy Guggenheim Collection, so after our routine 3 pm cappuccino my mother and I decided to take a break from the 15th and 16th century paintings and head to this modern art mecca on the Grand Canal. 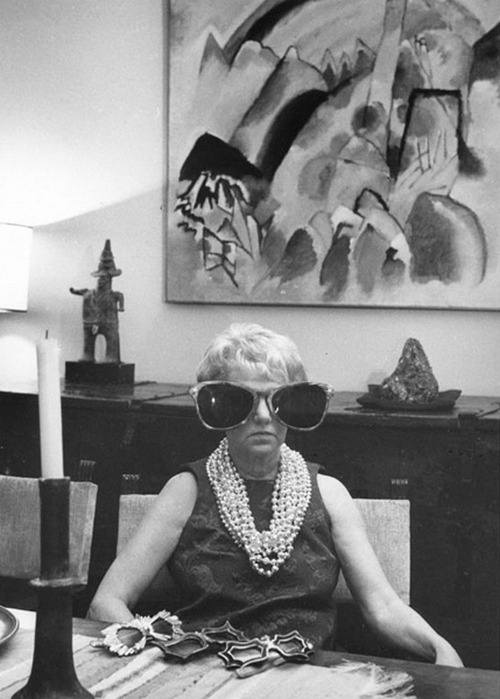 The museum was socialite and heiress Marguerite “Peggy” Guggenheim’s place of residence for thirty years. The building itself — the Palazzo Venier dei Leoni — is an extraordinary, unfinished 18th century Venetian palace with a low façade that sits overlooking the canal. Outside you’ll find an amazing garden with Giancometti sculptures and a bonsai tree gifted to Peggy from Yoko Ono. Inside, all of the white walls on the main floor have been transformed into galleries — twelve rooms of Guggenheim’s personal art collection, as well as photographs of the eccentric heiress. And if modern art isn’t really your thing because you think it’s something “a kindergartner could have done,” a trip to the Peggy Guggenheim Collection is still worth it, if only to go to see the views from the superb entrance and to admire the building itself. But most people can’t help but admit that Peggy had impeccable taste: her private collection includes Duchamp, Braque, Léger, Picasso, Chagall, Max Ernst (to whom she was married for a short time), Kandinsky, Mondrian, Miro, Man Ray, Dali and Jackson Pollock (whom she made famous), among others. The collection is heavily abstract expressionism and surrealism, but the eclectic art found in this modern gallery is truly a breath of fresh air in a city where antiquity abounds. So for the art enthusiasts out there, this place is like heaven. It was for me, at least — whenever anyone asks what my favorite museum is, I always say the Peggy Guggenheim because it is incredibly inspirational yet far from intimidating. Guggenheim was a bit wacky with her bat-like sunglasses and intellectual chicness, but her point was crystal clear when she said that “living in Venice, or simply visiting it, means falling in love with it and leaving no room in your heart for anything else.” And for me, the same goes for the museum she bestowed upon the city. Take a peek inside the collection at the museum’s website, and let us know what you think in the comments! Hadley has spent half of her college career studying and traveling in Europe. She is a college senior with a major in International Studies.